Siopao is one of my favorite Filipino snack. In my family we love to pair it with wonton soup and some siomai dipped in soy sauce and Kalamansi. Although we used to cook our own siopao , nowadays buying is a lot easier than cooking them as you can even find them in some Fastfood restaurants. 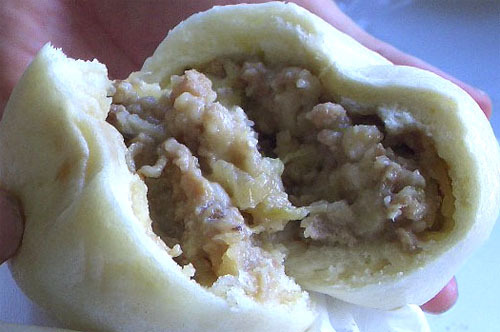 If you have time and would love to try the home-made version of Siopao here’s a great recipe to try. Sift flour and baking powder together in a large bowl. Add sugar in the flour. Pour warm milk in the flour gradually. Knead the dough until it becomes as soft. Divide the dough into 8 balls. Set aside. In amixing bowl put the ground pork, onion, ginger juice, soy sauce and sesame oil. Mix well. Put some salt and pepper to taste. Your dough balls will double in size, punch them down. Knead them one by one on your floured table. Flatten your dough, on the center put a sliced cooked egg and a scoop of your meatball filling. Gather sides toward the center, twist and be sure to seal it correctly. Place the pinched side down on a parchement paper. Cook in a steamer and steam for about 20 to 25 minutes depending on the size. could you recommend a good siopao in the malls? asado siopao or mix siopao is the best in town.